My first introduction to Kotagiri was through someone who had lived there and claimed that it was the prettiest place in the Nilgiris. Having visited Ooty and Coonoor earlier, I was surprised I hadn’t heard of it. My interest was fuelled years later when I read an article about Longwood Shola, one of the few remaining shola forests in the Nilgiris, and saw that name again — Kotagiri. In the summer of 2011, I visited Longwood and explored this little-known town. Kotagiri, home of the Kota tribes and picturesque trekking trails, lies below the busy town of Ooty and above the growing town of Coonoor. We checked in at Heavenly Stay, a quiet homestay run by a charming lady who plied us with scrumptious food at regular intervals. We had obtained permission from the District Forest Officer to visit Longwood Shola but to our dismay, we were informed on our arrival that the forest was temporarily closed for visitors due to a leopard attack the previous day. We drove down to the forest only to find all the gates closed. Eager to abate our disappointment, one of the workers at the cottage, a Badaga man, offered to show us around the area. We set off to the St Catherine Falls, Aravenu. It involved a walk up to one of those quaint viewing huts that are found throughout the Ghats and offered a splendid view of the rugged hills and the 250-ft jet of water gushing down the mountain. In the evening, we drove to Kannerimukku, home of the first European resident of the Nilgiris, John Sullivan, the then Collector of Coimbatore. He built this bungalow in 1819, and then went on to build Ooty. The bungalow itself has a rich history — it changed hands many times and was used as a summer home, godown, village school, cattle shed and was finally renovated and opened to the public in 2002. It showcases some ancient photographs, tribal art, implements used by the Kotas, Badagas, Todas and other tribes of the Niligiris. It even stocks the Nilgiris’ very own and rather impressive magazine — Bluest Heaven. We were then taken around the village and were shown the Panchayat-style meeting place of the villagers — a giant tree. Badaga women gathered at their doorsteps, made conversation and even invited us for a cup of tea. For old times’ sake, we decided to visit Coonoor the next day. We stopped on the way to see the Ralliah Dam, which was closed. A narrow trail led into a thick, silent forest which was completely deserted, offering an exhilarating hike. After lunching at Coonoor, we drove past Wellington and its famous Gymkhana Club and made our way upwards to the Ketti Valley View Point near Ooty. From there, one can see all the Badaga villages nestled in the valley, and the trail of the Nilgiri Mountain Railway — “where Chaiyya Chaiyya was shot” — our guide supplied helpfully. The Kodanad View Point was the high point of our trip, literally. Tea estates sprung up from the clouds on either side of the route in an unending expanse of green. We saw a lot of uniformed men on the road and learnt that Kodanad was Tamil Nadu chief minister Jayalalithaa’s summer retreat. We reached the view point after having heard for a few minutes the driver and guide debate about the number of rooms in her bungalow. A few plain clothesmen (who informed us they were Jayalalithaa’s guards on their day off) suggested we wait for a while — and in about half an hour, the mist lifted, unveiling to us a view that exhausts superlatives. The Mysore Plateau spread out before us, the green of the Thengumarahada forest extended up to the soft velvety mountains (the “folding hills”), the Rangasamy Peak stood out like a guardian, the mighty muddy-green Moyar river flowed through the plain and the white lines of the Catherine Falls cut through the brown rock. We took in this scene in a meditative silence. Suddenly, I saw two brown moving blobs in a clearing. “Elephants!” I yelled, waving at them impulsively. “Haha,” said the men politely, “you’re seeing cows.” Grabbing the camera frantically, I zoomed in, and one could see that they were quite unmistakably a bunch of elephants strolling in the sunshine. We took a couple of photos, and before we knew it, a thick fog descended on the mountain and the view was gone. The rest of the day was spent exploring the market in town. The ginger biscuits at the Royal Bakery come highly recommended. Also worth a visit is the Green Shop run by the Keystone Foundation, which stocks all kinds of eco-friendly products. 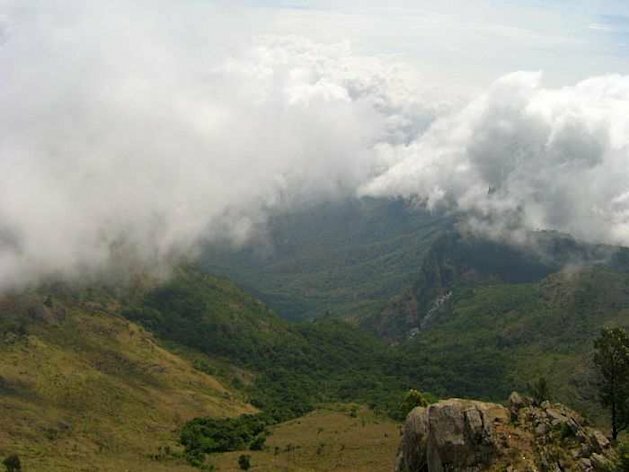 Kotagiri shows you a side of the Nilgiris which you might not have seen earlier. Away from the commercial hustle-bustle of the other hill stations, it gives you a chance to experience the mountains at your own pace, like a local and not a tourist. Tags:kotagiri, niligirs, published, travel writing, Western Ghats, Yahoo!